Nahagarh Fort is situated 6 kilometers outside the city of Jaipur. 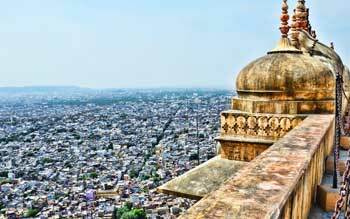 Before Jaipur was named the capital of Rajasthan, the city of Amer was the capital of the Rajputs. It was a bustling city with its markets, shops and trade flourished here. The three forts of Nahagrah, Amer and Jaigrah formed the defense of this capital. Nahagarh is situated along the Aravalli hills. The name Nahagrah means ‘Abode of the Tigers’ and was named after the Rathore, Nahar Singh. During the construction of the fort strange occurrences began to happen. Every morning when the workers returned they found their work done in the previous day was destroyed. Maharaj Jai Singh discovered that there was ghost haunting the land. Then they constructed a temple where the spirit could reside and named the fort after the spirit Nahagrah. Elephant Joy, Jewels Lake Palace and Sagar Lake. The best time to visit the fort is during the winter when the climate is pleasant. By air : The nearest airport is the Jaipur International airport. By train : The nearest rain facility is located in the Jaipur railway station. By road : The best way to reach the fort from Jaipur is by hiring an auto or a cab.